"I mean, honestly, if I could tell anyone, I would start the Paddison Program immediately. But it took me to this point to where I finally decided and it happened all in the right timing... So I asked her to recheck my CCP, my ESR, my CRP and my RF. Look What Verity Can Do Now! 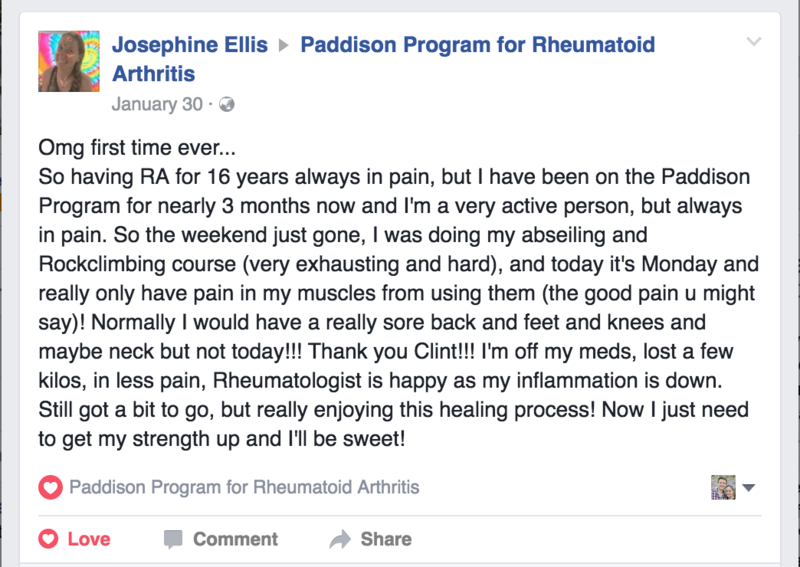 I have rheumatoid arthritis, I started the Paddison Program with my husband, and we thought talking to others with the same condition and gaining from their experiences would encourage, promote and support sticking with the new way of eating. The Paddison Program is a very positive community environment. Other subscribers offer insight, experience, suggestions, and encouragement. Clint follows all subscribers as well and offers suggestions and praise that keeps the momentum of a shift in eating and change to healing going.I have been on the program for two months. My pain levels have reduced from a steady 8-9 on a scale of 10 being the worst pain imaginable to 2-3 on a steady basis. I have had several days with a pain level of 0-1. I am not taking any medications for rheumatoid arthritis for two months. The program asks subscribers to look inside themselves for answers and to watch the cause and effect of foods that are consumed to the level of comfort or discomfort they feel from the rheumatoid arthritis. The program offers extended and valuable information from what to eat, how to introduce new foods, how to prepare foods, to the science behind what is happening in the body and the effect of rheumatoid arthritis and the role that a leaky gut plays in this disease. The Community Forum encourages honest conversations both within the forum and with the medical community, and it showers subscribers with encouragement, compassion, kindness,celebration, and gentle redirection when needed. The community forum is a vast cross section of people from countries on nearly every continent, with the exception of Antarctica and from people from all walks of life. The diversity of the people in the forum represents ages from young to aged, men and women, part time to full time employed, disability to retired, and every kind of profession imaginable. This great variety of people come together with the common goal of wellness through natural healing for the body to regain health and independence from pain. 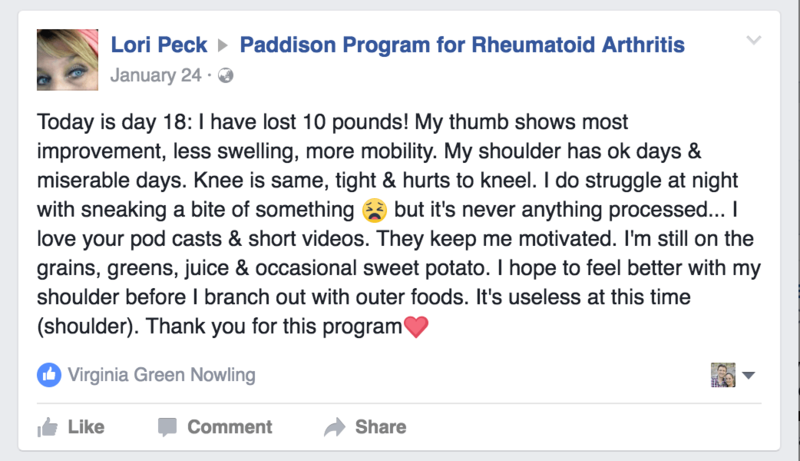 The Paddison Program is a unique community and everyone feels welcome and safe, and it is bridging the gap between diet and nutrition and medicine in the medical community. It is an exciting time and the forum has front row seats in the shift of understanding of what we consume daily and the affects our health. I was on numerous medications and ended up having a reaction to one that made me very sick. This was my motivation to look for an alternative. I have significantly reduced my medication levels, lost 19kg, back playing sports and feeling so much better about life. This is an amazing way of life." Before: Hi bro, I have been suffering from this disease for over 12 years. I’m 42 and recently release from hospital due to infection from using Humira, methotrexate 25mg, prednisone 20mg and ibrufen daily. I’m at wits end with these drugs. My body can’t handle anymore drugs. I’m asking if your book and plan will help me free from these drugs and give me some quality of life. I’m currently bed ridden. Swollen ankles, wrists, deformed right knee, high blood pressure due to inactiveness and drugs. WOULD YOU BE ABLE TO HELP. Blessings. 8 Days Later - Hi Clint, On the 8th day now. Body feels calm and relax. My pain markers down from 8 to 6. I think my case will a bit longer for I have been in heavy drugs for a while now. I’m happy with the progress so far. Feeling healthier is the best way. Will keep u posted. Blessings bro. Feeling really good physically and looking into the future with hope and optimism - and that alone is fantastic after all of the previous despair. 6 years ago I had a full body scan which revealed extensive inflammation in my joints. 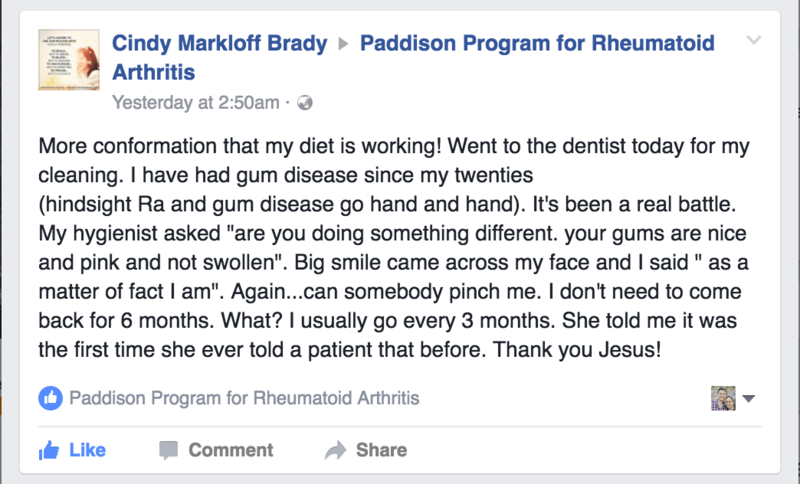 At the time I ignored the issue as I was relatively pain-free, but six months ago I began to experience joint pain which was rapidly spreading. I could not walk up steep stairs with my right leg, I was concerned about lifting a full kettle because my hands hurt and felt weak, and I would limp out of my bedroom in the mornings at a snail’s pace. At times my wrists would lock when I was walking the baby to sleep at night, and I walking in bare feet now felt like walking on bone; I could not do bear to do it for more than a few steps. Shopping was a painful experience because of the amount of time spent on my feet, and even carrying my 8.7 kg baby around hurt my body. My podiatrist was about to modify my orthotics to accommodate the swollen joint which was protruding under my foot. Then I came across the Paddison Program :-)This was the answer I had been praying for. As an academic with several degrees and a love of research, I had done some reading into the causes of rheumatoid arthritis. RA was not definitively diagnosed with me because my test results were negative though the symptoms were there, and I refused to act on the referral my doctor had given me for a rheumatologist. Nevertheless my condition behaved like RA in every way, so I began researching cures for this condition. Research time for me was restricted with a 1 year old, a 3 year old and PhD in progress, so finding Clint’s programme online was like stumbling across a pot of gold. His book echoed all of the findings I had made myself, and added so much more!Within the first two weeks virtually all of my joint pain had subsided. I felt like I had lost 30 years (I’m only 42, but had been feeling 60!) I am still working through the Programme, and Clint has been immensely supportive with questions which have arisen along the way. My energy levels have doubled, and the crippling fatigue and sickening bodily ache I used to experience by the end of each day has disappeared. Whereas before I wondered how I would deliver my lectures and care for my children from a wheelchair, I now look forward to a fantastic future!I am profoundly excited at the relief Clint’s Programme will offer to many hundreds of sufferers around the world, and I feel so immensely blessed it was out there for me. It is out there for you too, if you dare to make the changes you need. Clint says that his Programme requires bulldog determination, but you can do it! He says that we can choose between the pain of discipline and the pain of disease. So true.Find the courage to make the change today. You will never look back. Leave your aches behind and claim your life back. All you need to know is in this little book! I wish you well. At age of 8 I was diagnosed with JRA. Now at the age of 49 I have been experiencing more symptoms of Arthiritis. My left knee has very little meniscus tissue left and I walk with a cronic limp. I was living on naproxen and trying any supplement I could to find relief. No help, until now. For the last six weeks I have implemented the Paddinson Program. I have not taken a naproxen or any supplements since the start. My limp is gone. I have lost 17 pounds and feel great. My blood pressure which normaly is around 130/78 is now 112/71. I cannot tell you thanks enough for the help that you have given me. I feel like I can do anything. You have forever earned yourself a friend and my praise. Thank you for sharing this life changing Program with us. I had developed a form of arthritis in my hands.Within 3 days the pain and stiffness had gone and the swelling was going down and I could bend my fingers freely first thing in the morning again! I was very surprised and hugely relieved! The diet is not easy, but it has helped me to identify certain foods that contribute to the problem. (Certain legumes, coffee, citrus fruit). I'm now at the stage I'm able to have more foods in my diet that I know won't cause me a problem. My own worst enemy is myself as I know that milk is a major trigger of the arthritis and my eczema; I've managed to largely cut it out of my diet, and take a calcium with vitamin D supplement instead, however, I do still occasionally get a weakness for milk chocolate, and suffer the consequences. The doctor suggested over the counter pain medication, however, I do not need any pain medication. I just take the calcium + vitamin D supplement. As I play musical instruments, it's a wonderful relief to know that I can have control over the problem. It isn't easy, and I do miss certain foods and I notice the difference the next day if I eat out at a restaurant - despite trying very hard to avoid certain foods. 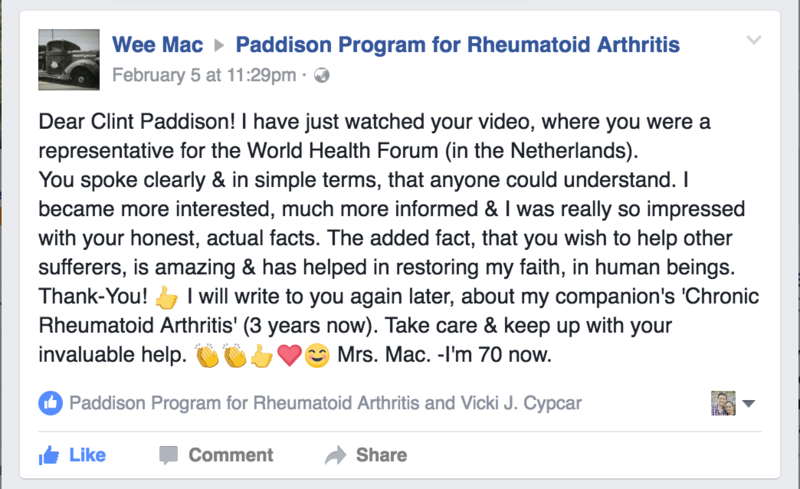 I purchased the Paddison Program when I finally got angry about my arthritis, believing I do not have to have this. I am very satisfied with this program, it is very well put together with pictures, diet, and plan. The recipes and booklet were great also, explaining the properties, vitamins of every food in the program and just how it was going to help me was encouraging. I have read it over and over, and again and again I am encouraged. Nothing has been left out of this program, except for my will, and the Paddison's will and success has helped my will.